Astronomers have detected nearly 1,000 planets outside of our own solar system, but little is known about their composition. Now, the Gemini Observatory's Planet Imager enables scientists to image exoplanets directly. 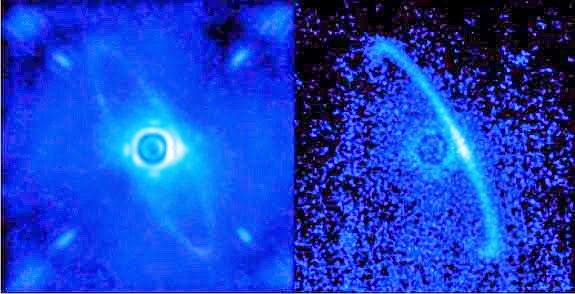 Current planet-imaging systems are only able to see gas giants about three or more times the size of Jupiter. NASA's Kepler space telescope has detected thousands of smaller planet candidates but cannot image these directly. "Almost nothing is known about the composition of the planets Kepler is seeing," principal investigator Bruce MacIntosh, a physicist at Lawrence Livermore National Laboratory, said in a news conference here today (Jan. 7) at the 223rd meeting of the American Astronomical Society. "Direct imaging is offering a way to do that." Gemini Planet Imager’s first light image of the light scattered by a disk of dust orbiting the young star HR4796A. This narrow ring is thought to be dust from asteroids or comets left behind by planet formation; some scientists have theorized that the sharp edge of the ring is defined by an unseen planet. Image released Jan. 7, 2014.